Vintage watches are growing in popularity and, if recent auction results are anything to go by, that doesn't look like it'll change any time soon. Capitalising on this trend, Omega has just released a limited edition run of brand new vintage pieces, taking 18 original movements and turning them into never-been-worn chronographs. 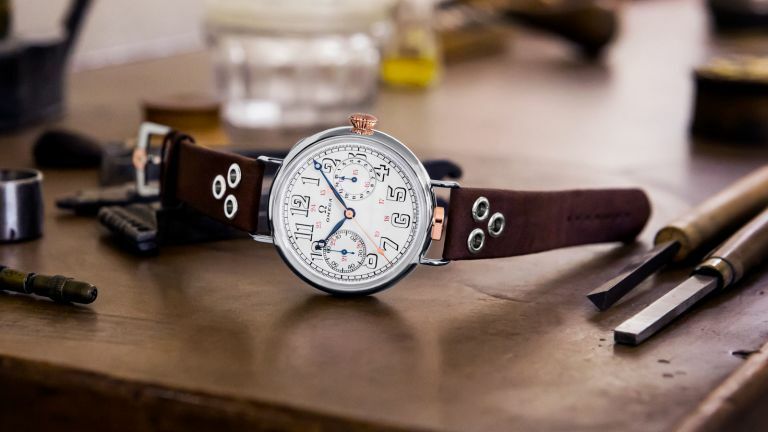 The outside design closely follows a popular Omega wrist-chronograph design from 1913, with a white enamel dial, hollowed Arabic numerals, and blued “Empire” hands. The case, which can be opened from the back to reveal the movement inside, is crafted from 18K white gold, with of 18K Sedna gold highlights. It's finished with a brown leather strap with white gold rivets. Inside the white gold case is an original 18’’’ CHRO calibre from 1913, which has been retrieved from the vaults at the Omega Museum. These prized calibres have been fully refurbished by the experts at Omega’s Atelier Tourbillon, using machines which were used to create the movements over one hundred years ago. Several hundred hours of handcrafted work went into transforming each movement, ensuring that the piece remained as true to history as possible. Each chronograph is delivered inside a handcrafted leather trunk, which includes two additional leather straps in novonappa gold leather and burgundy leather, as well as unique strap-changing tools, loupe and a travel pouch. To read more about the First Wrist-Watch Chronograph head over to Omega's website.